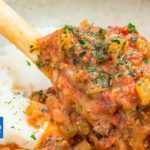 Keto Lamb Shanks Recipe Pressure Cooker [or Slow] - Falls Off The Bone! This Lamb Shanks Pressure Cooker recipe is the ultimate comfort food! The tender meat coated in a rich sauce, there's nothing better for an evening meal. 1 cup lamb broth We provided a link above to our Lamb Broth recipe, if you don't want to make that use the link to the left. Place your pressure cooker over high heat and add half of the olive oil. Brown the shanks and set aside. Add the remaining oil to the pressure cooker and add the garlic, onion, celery and rosemary. Saute until fragrant. Add the salt, pepper and Lamb Broth, mix well, Then add the diced tomatoes. Return the shanks to the pressure cooker and ensure they are coated in the sauce. Place the lid on the cooker and set to high pressure. Cook for 50 minutes. Turn off the heat and allow to the cooker to depressurize for 15 minutes. Remove the lid and take the shanks from the sauce, set aside and cover with foil to keep warm. Place the pressure cooker over high heat for 10 minutes to reduce the sauce. Serve your shanks with a side of Buttery Cauliflower Mash.